The New York Insurance Association said Thursday the Buffalo-Niagara Falls metropolitan area has the highest vehicle theft rate in New York State. The region had a vehicle theft rate of 161.19 thefts per 100,000 inhabitants in 2011. The Buffalo-Niagara Falls area had the highest vehicle theft rate in the state since at least 2007, according to the association. On the other hand, the Elmira metro area was found to have the lowest theft rate in the state — with a vehicle theft rate of 30.39 per 100,000 inhabitants last year. In a new report, the National Insurance Crime Bureau outlined the 2011 vehicle theft rates on a per capita basis for the 12 “Metropolitan Statistical Areas” in New York State. 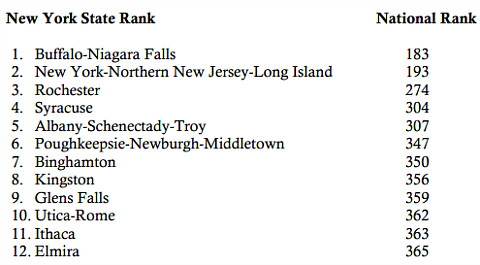 The statewide ranking is as follows, along with each region’s national ranking. Each year, National Insurance Crime Bureau analysts review vehicle theft data obtained from the National Crime Information Center for each of the nation’s metropolitan statistical areas. These regions — designated by the Office ofManagement and Budget — often include areas much larger than the cities for which they are named. The rate is determined by the number of vehicle theft offenses per 100,000 inhabitants. The latest report found that theft rates in New York State remain far below the national norm. “The vehicle theft rates in the metropolitan areas of New York State rank in the lower one-half of the nation,” Ellen Melchionni, president of New York Insurance Association said. Even Buffalo-Niagara Falls — the metropolitan area with the highest vehicle theft rate in New York State — is 183 out of the 366 Metropolitan Statistical Areas in the report, Melchionni observed. The Elmira area, which has the lowest theft rate in the state, ranks second to last in all Metropolitan Statistical Areas in the nation. The report also found that 10 of the 12 areas in New York State reported lower thefts in 2011 than they experienced in 2010. Only the Glens Falls and Binghamton MSAs reported an increase. “The lower theft rates are a reflection of the commitment of the insurance industry and law enforcement to crack down on theft,” Melchionni said. The chart below shows the list of New York State Metropolitan Statistical Areas with number of thefts and theft rates for the years 2011 and 2010.